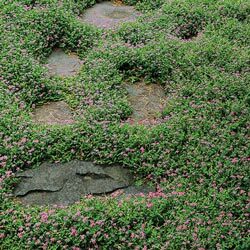 In no time, you'll have a carpet covered with clusters of tiny pink blooms all summer long. 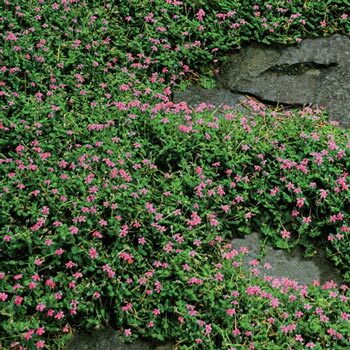 This is perfect for rock gardens, in walkways, between patio bricks and as a border planting. Tough enough to take foot traffic and remain beautiful, space 12-15" apart. Bloom Time Late spring to summer. Foliage Type: Linear to elliptic, slightly hairy, green leaves. Bloom Time: Late spring to summer. Flower Form: Clusters of tubular, 2-lipped pink flowers, each between 1/8 and 3/8 inch long. 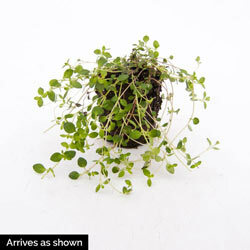 Planting Instructions: Set plant at same level it is growing at in the container. Firm soil and water thoroughly. 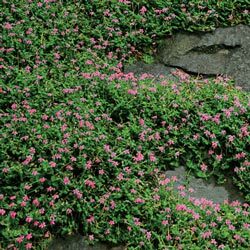 Best in a rock garden, where allowed to spread freely between rocks or walkways without being crowded by other vigorous plants. Soil Requirements: Well-drained, neutral to alkaline soil. Pruning: No pruning needed unless you want to control the spreading. Additional Information: Good companion plants - Delosperma cooperi - Ice plant, Gypsophila cerastioides, Sedum spurium.